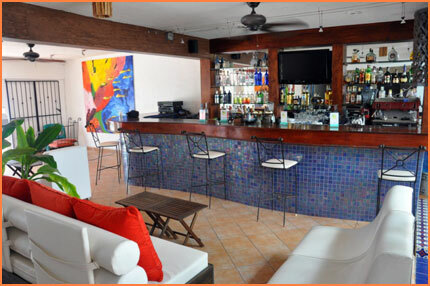 The Flamingo prides itself on a high level of personalized service and attention to guests' needs. 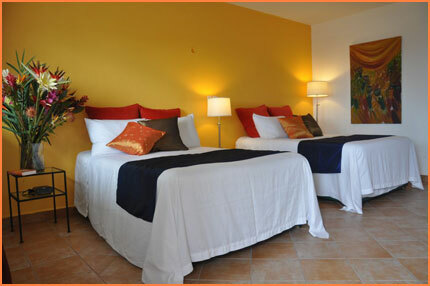 The rooms are designed to impress while keeping comfort in mind. 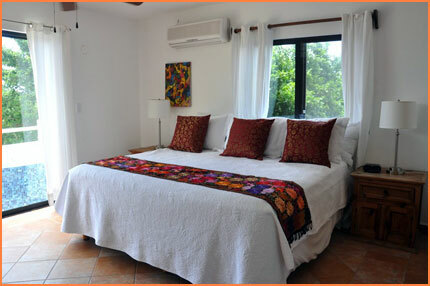 Original Cuban art is a feature as well as all the conveniences and comforts you would expect. Enjoy a delightful open air restaurant in a lush garden or at shady sidewalk tables where service begins each morning with a wonderful Mexican or American breakfast. In the evening dine under the stars and enjoy one of the amazing international dishes. 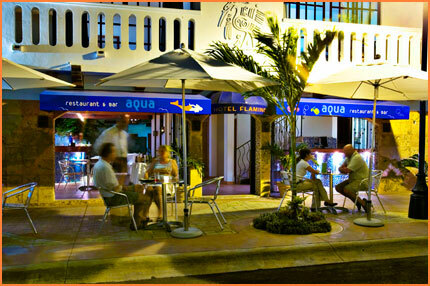 The Aqua Bar is the place to meet friends after an eventful day. 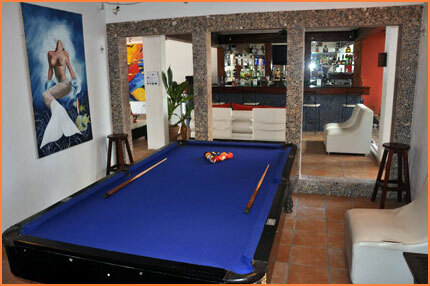 Taste one of the many exotic tropical cocktails, sip a cool Mexican beer in the lounge or play a game of pool. For those looking to get away from today's rapid pace, the Flamingo provides a spacious and stylish environment in which to relax, meet new friends, and enjoy the better things in life. 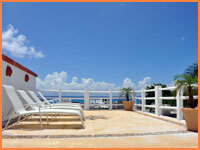 Package prices are available upon request that include meals, diving, spa services or fishing. All stays include deluxe breakfast: fresh fruit, main course of choice - eggs to order, omelette, pancakes, or french toast - toast, fresh juice, choice of tea, coffee, capuccino, or espresso. More information about the type of accommodation available are below. Courtyard Rooms are on the second and third floor and face onto the garden courtyard area. All courtyard rooms are spacious (420 square feet or 39 square meters) with en suite bathroom with shower, air conditioning, international direct dial telephone, cable television, hair dryer and ceiling fan. 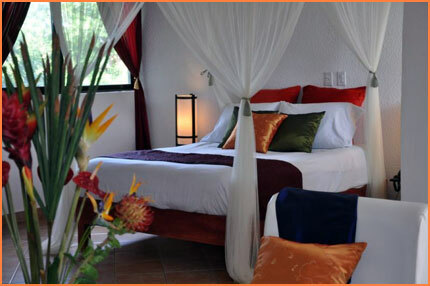 Each room has two double beds, which can be put together to create a king bed. Maximum occupancy of three adults per room. Includes full breakfast each morning. Your choice of eggs cooked to order, coffee, fresh orange juice, fresh fruit and toast or croissant. 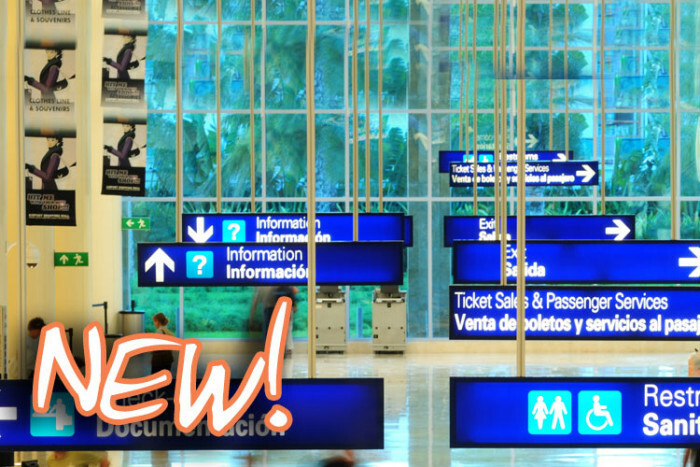 Free WiFi available in the lobby and at the hotel's Aqua Bar. Superior Rooms are on the second and third floors and face south towards town or are located at the rear of the hotel. 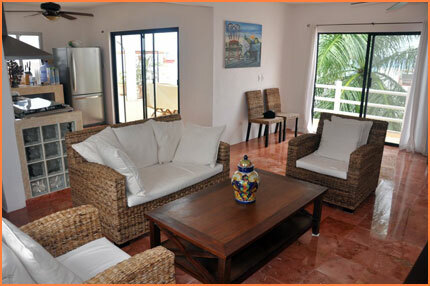 Some rooms have high ceilings, balconies, and some have sitting areas. All superior rooms are very spacious (450 square feet or 42 square meters) with en suite bathrooms with shower, air conditioning, international direct dial telephone, hair dryer, ceiling fan, mini bar, electronic in-room safe, and cable television. 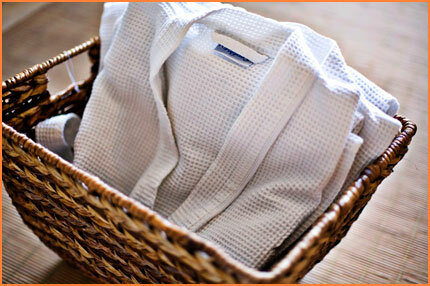 Each deluxe room has a queen bed fitted with luxury bed sheets and covered with mosquito netting. A third person can be accommodated with a roll away bed. 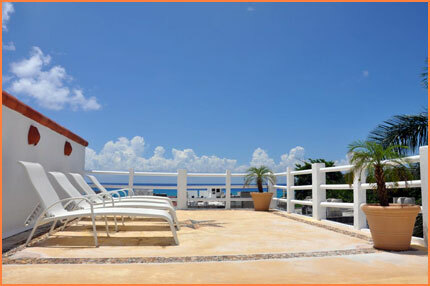 The Villa is a secluded slice of paradise with beautiful sweeping views of the Caribbean. It is located on the third floor rooftop with views of the turquoise waters from the living room, front bedroom, and kitchen. The penthouse is very large (over 970 square feet or 90 square meters) and that does not even include the large private deck. The unit has 2 bedrooms, full gourmet kitchen, large living room with ocean views, one full bathroom with shower, one half bathroom, hair dryer, mini split zone air conditioning, cable TV, high speed internet connection, ceiling fans through out, electronic in-room safe, and huge private deck space with ocean views. The first bedroom with ocean views has one double bed fitted with luxury bed sheets. The second bedroom has two double beds fitted with luxury bed sheets. Maximum of 4 people.